January 16, 2011 - Eurocopter South East Asia (ESEA) unveiled its new 8,200-square meter Singapore facility, which is a key element for the growth strategy of this Eurocopter regional affiliate in the dynamic South East Asia helicopter marketplace. Located in Singapore?s redeveloped Seletar Aerospace Park, this facility provides a 25 percent increase in office space and a doubling of hangar capacity to support ESEA?s expansion in training services; maintenance, repair and overhaul (MRO) capabilities; research and development; and design resources. The inauguration was held in the presence of Lim Hng Kiang, Singapore?s Minister for Trade & Industry, who was joined by Eurocopter President & CEO Lutz Bertling. ?With its new and larger premises, ESEA is ready to meet the sales and services opportunities across South East Asia as the region?s economic recovery continues,? Bertling said. ?ESEA has a track record of demonstrated growth during the past decade, and is well positioned to support the continued evolution of Eurocopter?s presence in this key marketplace.? ESEA?s move into the new facility represents a return to where it was created more than 30 years ago as a company called SAMAERO. Operations began in a one-storey colonial bungalow in Seletar West Camp with 12 staff members. The company moved in 1988 to a larger facility at Loyang Way, where it was located until the latest transfer to the new location at Seletar Aerospace Park. The doubling of hangar space significantly increases ESEA?s maintenance, repair and overhaul capabilities, as 24 helicopters can now be accommodated ? compared to 12 at the previous facility. ESEA?s new location also offers an improved infrastructure for its training arm, the Singapore Helicopter Training Center (SHTC), which has trained some 350 pilots and technicians annually for type rating, refresher, specific mission, and on-job training courses. SHTC also provides training programs for regional college and university students as part of its talent development plan to groom a pool of future rotary-wing industry professionals. 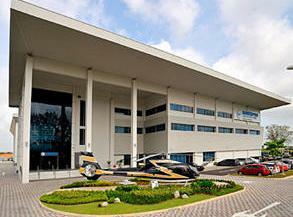 The Seletar Aerospace Park facility will also house personnel from EADS Innovation Works the worldwide research center network for Eurocopter?s EADS parent company enabling them to work closely with ESEA in research and development activities, along with collaboration on promising innovation projects. ESEA?s newly-inaugurated operation is also authorized for design modification and repairs on Singapore-registered helicopters in terms of structures, avionics and electrical systems integration, as well as cabin interiors and furnishing. This results from its recent Design Organization Approval issued by the Civil Aviation Authority of Singapore, which builds on ESEA?s status as the only subsidiary in Asia that is a Eurocopter Authorized Design Organization. Eurocopter South East Asia (ESEA) is the Regional Headquarters of Eurocopter, the world?s leading helicopter manufacturer. Established in 1977 in Singapore, ESEA handles the sales and customer support activities of 15 territories in the region. In 2010, ESEA achieved a turnover of 127 million Euros. With a staff-strength of more than 200 professionals, the company has developed a successful commercial network of Singapore-based sales team and regional sales managers and technical representatives.